Jersus Colmenares López was born in southwestern Venezuela near the Colombian border. The child of a plumber and a vocational school teacher, his parents came from extreme poverty, but were determined to provide the best lives possible for their children. Colmenares López grew up without luxuries, but had a roof over his head and food in his belly—more than most of the children in his town could say. Most importantly, he was loved. At a young age, Colmenares López was diagnosed with an immature, hyperactive brain, but his mother refused to allow this to define her son. 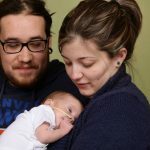 His parents sought help from the best doctors, traded work for medical help and also saved to pay for medical assistance that was beyond their means. None of the medical advancements at the time were helping, so his mother decided to act on her own. She stayed home to educate Colmenares López, paid tutors—a rare thing in rural 1980s Venezuela—read books and asked for advice from psychologists and other human mind experts. Determined to prove his doctors wrong, Colmenares López’s parents enrolled him in art school and taught him how to play musical instruments, swim, cook and iron clothes at an early age. One memory I treasure is my mother’s scandalous request to a welder to make me a left-handed school chair, something that was culturally and superstitiously frowned upon by people back then—and something much harder for a child to take to. She made the school accept the chair in my third-grade classroom. They also enrolled him in an English-speaking school. Every day, his father would drive him and his siblings the hour-long commute to the school in another city to make sure they were getting the best education possible. 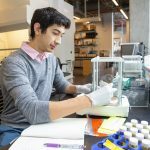 When it came time for college, thanks to the unwavering support and encouragement of his parents, Colmenares López decided to pursue a higher education. Though college in Venezuela was technically free, not all could afford the expenditures associated with earning a degree. With no money for textbooks, technology or other resources, Colmenares López had to work three jobs to be able to stay in school. Colmenares López graduated with his bachelor’s degree. But he was just getting started. 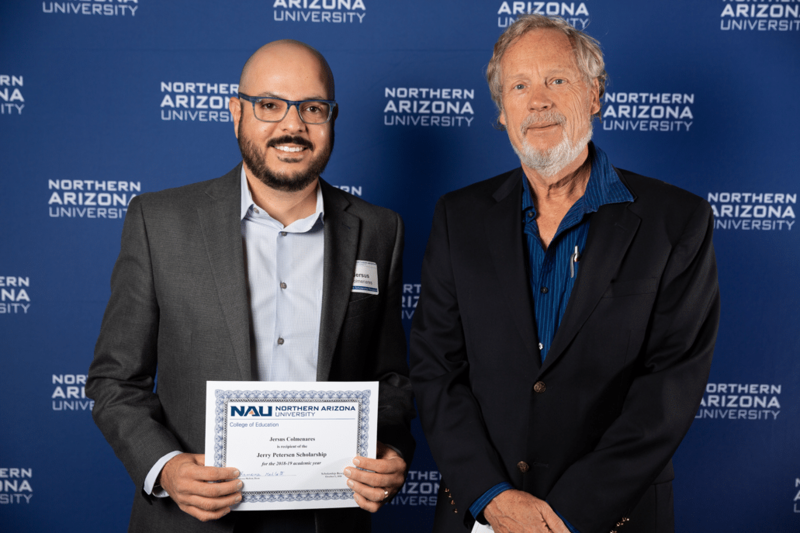 Colmenares López accepts the Jerry Petersen Dissertation Scholarship—one of several scholarships he received from NAU. 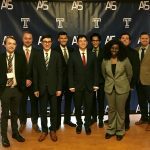 A Fulbright Program grant allowed Lopez the opportunity to pursue a master’s degree in the United States. 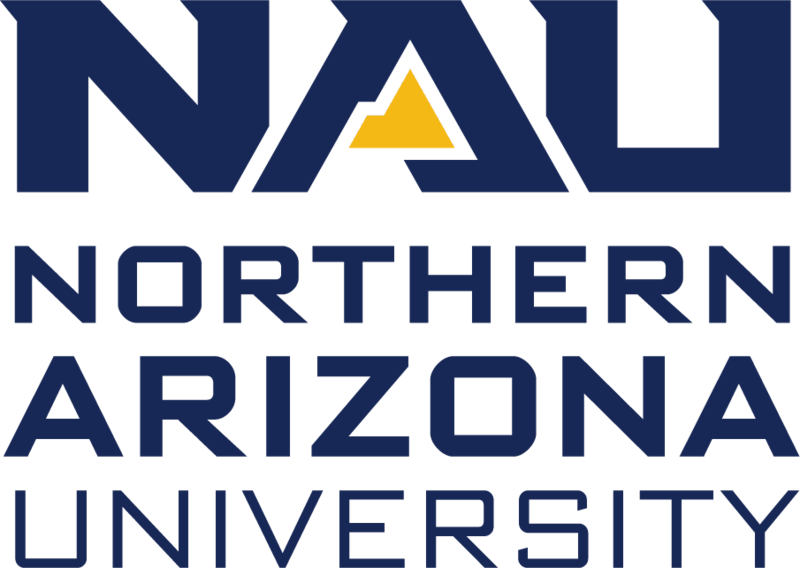 Through the process of researching universities abroad, a Department of State official suggested he look into Northern Arizona University. 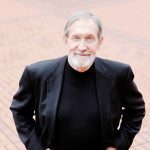 After discovering the author of one of his favorite textbooks was based in Flagstaff, he was sold. 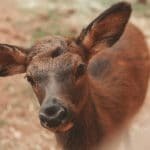 He enrolled at NAU in 2006. 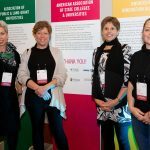 After completing his master’s degree, he felt compelled to pursue a doctorate degree with the hopes of creating interfaces that would translate highly beneficial research findings about language into education solutions for students and teachers. But, tension between Venezuela and the U.S. sent him and his wife back to their home country. 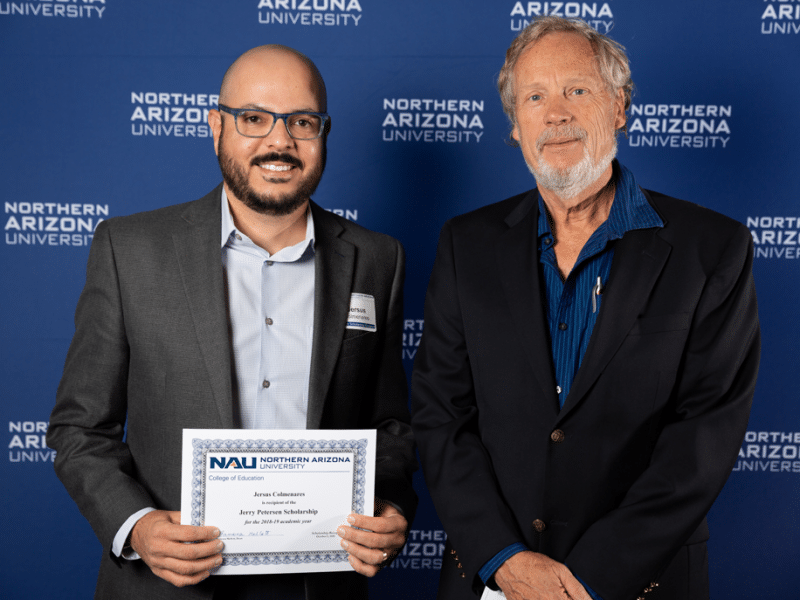 Three years later, his former NAU professors encouraged Colmenares López to apply for admission to the curriculum and instruction doctoral program and fulfill his academic dream. I came back to Flagstaff to continue my doctoral studies with my wife, three children and $10. 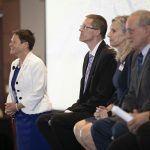 With almost no diplomatic or consular relationships between my country and the U.S., it simply was a miracle that we were given visas to come back to NAU. Over the course of the next couple of years, Colmenares López faced a number of challenges, particularly in terms of immigration, and most importantly in terms of keeping his family fed and sheltered. After his country refused to give them new passports, problems with immigration documents, extensive visa requirements and what seemed to be endless obstacles, Lopez’s wife and children received a notice of deportation. With his family safely in the U.S., the worst was behind them, or so they thought. López’s wife starting experiencing an array of health issues that required an important surgery. 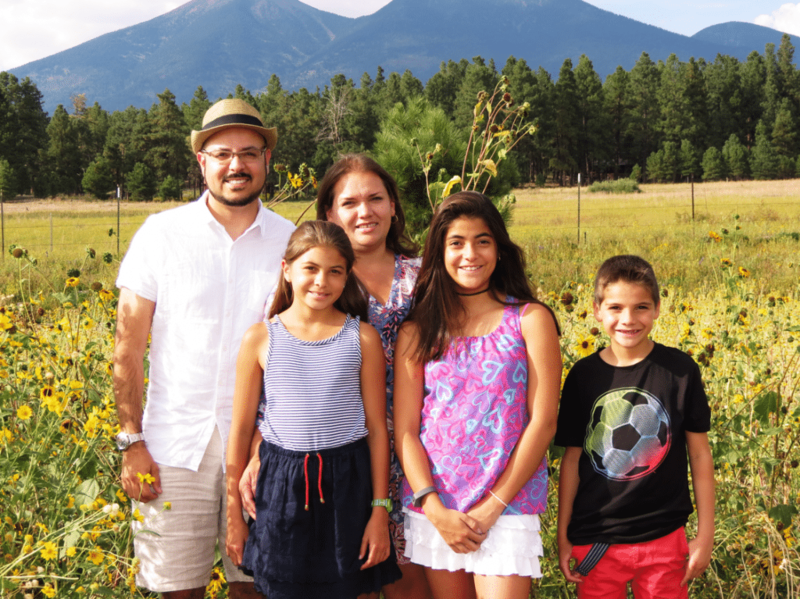 Raising three kids, with a sick wife, while working to provide for his family and complete his Ph.D. would have been debilitating if it weren’t for the assistance he received while at NAU. An NAU student of Colmenares López congratulates him on the completion of his doctoral degree with homemade cupcakes. 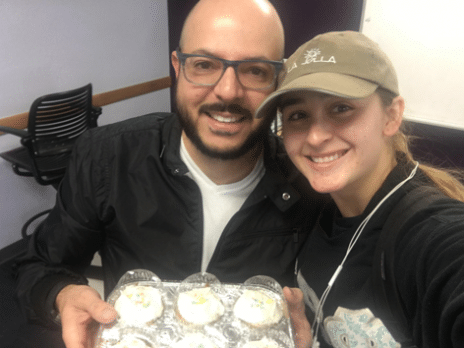 In the final year of his degree, Colmenares López worked as a professor in the Department of Global Languages and Cultures, developing his dissertation out of the perceived need to help his students learn Spanish in more meaningful and effective ways. 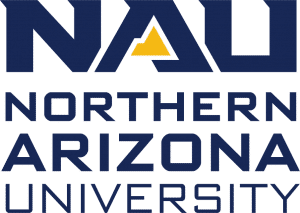 Without the sacrifices of his family, Colmenares López would never have found his way to NAU—he credits them for his success. Under extremely difficult circumstances, they will be watching him walk across the graduation stage, more than 3,000 miles away. Congratulations! We are fortunate to know you and your family. ¡Felicidades, hermano! I’m so proud of you, and it’s an honor to call you a friend and colleague. ¡Felicidades, Jersus! You have been and continue to be an incredible inspiration and wonderful friend. This is only the beginning!